If you were looking for an immersive casino with a strong visual identity, you have found the one. Mr Green welcomes you to an all-green adventure, and this time the emblematic color should be good luck! Created in 2008, the Swedish website quickly became available in the whole Europe. Unfortunately for those living in the US, the online casino is still not available there. To create an appealing brand, the team has invented the iconic character Mr Green, a gentleman that always brings his green umbrella and endearing manners to the party! If Mr Green is not one of the biggest online casinos out there, it sure feels like a private club, with great values and family sense. If you want to feel part of a community, you cannot go wrong here. 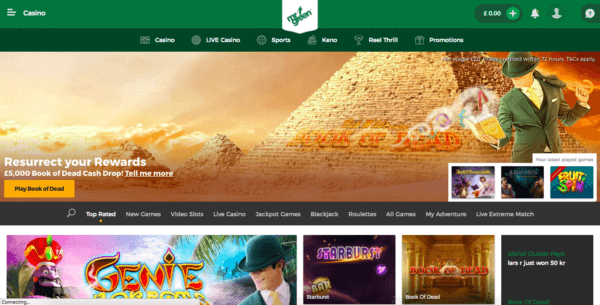 There is nothing to dislike about Mr Green’s online casino design unless of course, you have an allergy to the green color. The graphics are simple and clear, featuring nice characters and updated with popular events. For example, the Octoberfest was the guest star in late September. We can only imagine how creative it gets on Saint Patrick’s Day! But enough about the design and more about what we are truly here for, which is playing. Make sure you switch off the sound if you don’t want to disturb people sitting next to you. However, games soundtracks really add to the experience! Creating an account is simple, and within two minutes you will be able to make your first deposit, which can be as small as 10£. You will have to choose between various welcome bonuses. The Marvellous Casino Adventure Bonus is the default one, that enables you to double your deposit and get 200 free spins to start enjoying your new favorite gambling place. Here’s the part that matters the most, does the casino offer games that are both entertaining and worth playing? The answer is yes. First of all, Mr Green will provide you with all your favorite casino games, from Roulette to Blackjack, not forgetting Poker. If you like it realistic, Mr Green also offers live casino games. The online casino has really what it takes to keep you entertained for long hours, as you will find no less than 29 different Blackjack games and 40 games of Roulette! There is no way you can get bored exploring the limitless options of this giant casino. In addition, all the games have very elegant design and provide you with a great immersive experience. Mr Green encourages responsible gambling and provides its players will tools that help to control the way you spend money, for more fun and no trouble. Directly on the website, you can set your personal weekly deposit limit, so you have a better control over your losses and don’t find yourself in difficult situations. Using the weekly deposit and betting limit called the “Green Program” enables you to keep control over your playing and to make sure that you don’t get ahead of yourself and do things that you could regret later on. Although the website runs very smoothly on a computer, you might want to keep on exploring this emerald heaven on your way to work or on a train. This is not only possible but a whole new experience. The application is available both on IOS and Android phones and the quality remains impeccable. There is nothing more annoying then facing a problem and not being able to reach any member of the customer service team. The good news is: this will not happen to you if you play on Mr Green. The efficient and friendly customer service is active 24/7, so there is no hour of the day or the night your problem will not be solved. It is always a plus to know that you are in good hands. Overall, Mr Green is a great online casino, available in many countries, with a flawless design. The gaming options are so numerous that you would need hours and hours to try all the games. With the responsible betting tools, playing has never been more fun and safer. You can play, knowing that nothing will go wrong. Mr Green provides its players with a casino that has good values and that is very entertaining. The only thing is that the payment methods are quite limited.